The Model layer represents one part of the application that implements the business logic. Models are representations of database tables. They can connect to database, query it and save data to the database. 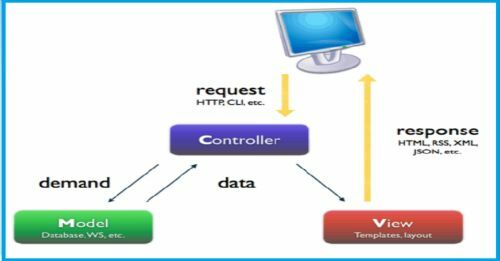 In order to work with MVC its very important to note that there must be no interaction between models and views.All the logic will be handled by controllers. It’s responsible for fetching data and then after converting them into meaningful concepts for the application by processing,validating, associating or other similar tasks related to handling data. You can describe Views as template files that present their content to the user.variables, arrays and objects that are used in views are registered through a controller. A presentation of the modeled data will be rendered by the View.View will produce the presentational interface for your application using the information it has available. For example, A set of data returned by the Model layer, will be used by the view to render a HTML page containing it.The View layer is not only used for HTML or text representation of the data,but also used to deliver a wide variety of formats.Like videos, music, documents and other format. Requests from the users are handled by the Controller layer.Controller mainly contains the logic of your application. Controller offers various functionalities,they retrieve the data and modify them by accessing database tables through models.They also register the variables and objects, that can be used in views. You can consider the Controllers as managers taking care that all needed resources for completing a task are delegated to the correct workers. They wait for petitions from clients, and then checks their validity according to the rules of authentication or authorization, processing to the model, and selects only the correct type of presentational data which are expected by the client ,to finally delegate this rendering process to the View layer.